Another post today for Lawn Fawn inspiration week! Today I have two projects to share, we are featuring the new Stuck on You stamp set and the new picket fence border die. For this card I used the coordinating Stuck On You dies to cut out some felt in various green colors and layered this onto a piece of cardstock also cut with the die to give it some rigidity. I stamped the cactus image on piece of typing paper then used it as a template to pierce holes for the stitching details. The sentiment is from So Much To Say and fits perfectly in one of the new stitched labels. 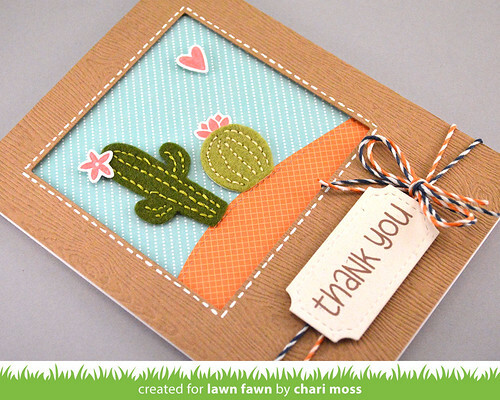 I used kraft woodgrain embossed cardstock to create the frame for the cactus scene and used one of the stitched square dies to cut out the opening. My second card today features the picket fence die, this die set has three parts, the fence, a gate and then a stitched detail strip that layers on top of the fence for some nice dimension. I created a flower box with Penelope's Blossoms to put on my little fence. I love how the new inks stamp the solid images of this set. 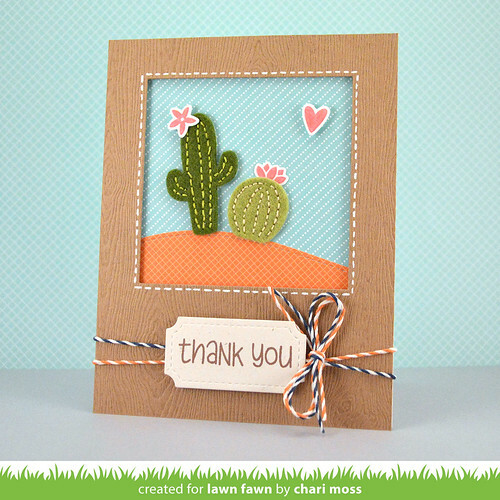 Chit Chat was perfect for finishing off this card. Honestly I had a hard time picking which sentiment from that set was best for this card, any of them would have working wonderfully. 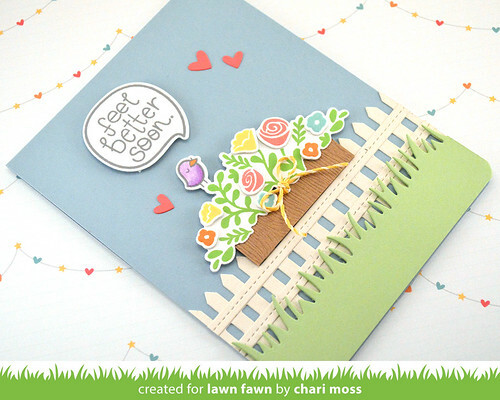 Be sure to stop by the Lawn Fawn blog for more projects with Stuck On You and the new picket fence die. Both cards are adorable! I love the felt cacti!! Chari, I just love your work. These cards are a good as any I've seen. (Hence my reason for subscribing! LOL) TFS! Your "feel better soon" card is so happy and cheery! Wow! Both cards are so great. Love the felt cactus - great idea!